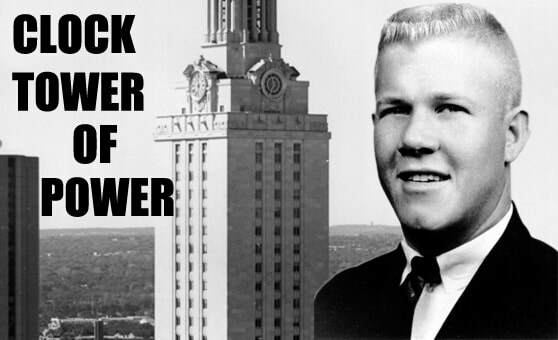 Among the names that have gone down in infamy is that of Charles Whitman, a trained marine sniper who on August 1, 1966 murdered his mother and wife in their Austin, Texas homes, then carried various weapons to the top of the University of Texas tower, killing three people on the way. Once at the top he went on a 20-minute shooting rampage, killing nine students and wounding 30 others before he was gunned down by police. Until the Virginia Tech shootings in 2007, the Whitman mass killing was the deadliest in U. S. history. The act was so shocking to the nation that few Americans who were around in 1966 have forgotten his name and what he did. Whitman was born June 24, 1941 in Lake Worth, Florida. He was a model student and an Eagle Scout, but he suffered from living in a home with a violent father. He left home to join the Marines to escape the home situation. After his stint with the Marines he enrolled at the University of Texas. There he met and married Kathryn Leissner. In 1966 Whitman began suffering from severe headaches and he consulted a university therapist because he said he was concerned about his mental health. Also that year, his mother left his father because of the abuse at home. She moved into an apartment in Austin to be near her son and his wife. For reasons unknown, the day Whitman went on his killing spree, he first entered his mother’s apartment where he stabbed and shot her to death. Then he went to his own home and stabbed Kathryn to death in her bed where she was sleeping. Strangely, Whitman left apologetic notes behind at the homes, saying he could not explain why he was committing the murders. "I cannot rationally pinpoint any specific reason for doing this," he wrote. That morning, armed with several weapons and lots of bullets, Whitman went up in the tower where he began shooting anybody in sight. The rampage went on for about two hours before police managed to shoot and kill Whitman. An autopsy found that Whitman was suffering from a brain tumor. This was believed to have been the cause of his headaches and possibly his moment of deadly insanity on that warm August day.